T/175193 Corporal Albert George Anning of the 54th Infantry Brigade Group Company, the Royal Army Signal Corps. Son of Thomas and Edith Anning (née Hornsberry) of Dawlish; husband of K. M. Anning of South Harrow. Born in Dawlish in the March Quarter of 1915. Died 12 September 1944 aged 29. D/SSX 27349 Petty Officer George Henry Baker of the Royal Navy. HMS Eclipse. Son of Frederick and Phyllis Baker (née Pearce); husband of Isabelle King Baker. Born in Dawlish in the September Quarter of 1920. Died 24 October 1943 aged 23. Awarded the Distinguished Service Medal - citation date not yet known..
30645 leading Stoker Walter John Bastin of the Royal Navy, HMS Hecla. Son of Elias and Agnes Bastin (née Harding) of Holcombe, Dawlish; husband of Alice Maud Bastin of Holcombe. Born in Dawlish in the September Quarter of 1890. Died 12 November 1942 aged 52. 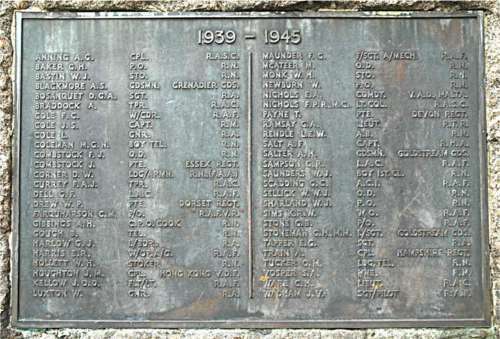 Commemorated on the Plymouth Memorial. 2616128 Guardsman Arthur Sydney James Blackmore of the 6th Battalion, the Grenadier Guards. Son of John and Edith Blackmore (née Maunder) husband of Ruby Doreen Blackmore of Datchett, Bucks. Born in Dawlish in the June Quarter of 1923. 8 November 1943 aged 20. 843518 Sergeant Douglas George Anthony Bosanquet of 5 Searchlight |Regiment, the Royal Artillery. Son of Bertie and Millicent Bosanquet (née Hall) of Dawlish. Born in Bristol in the September Quarter of 1914. Died 5 March 1943 aged 28. 3644831 Trooper Albert Braddock of the Royal Armoured Corps, the Tank Regiment; formerly of the Life Guards. Son of John and Sarah Braddock; husband of Patricia Rita Braddock of Wandsworth Common. Born in Manchester in the September Quarter of 1899. Died 17 June 1940 aged 41. Commemorated on the Dunkirk Memorial. Wing Commander Francis Charles Cole of 102 Squadron, the Royal Air Force. Parents not yet identified. Born in Dawlish in the June Quarter of 1909. Died 8 April 1941 aged 32. Captain John Simcoe Cole of the Royal Marines, HMS Curacoa. Son of Francis and Phyllis Simcoe (née Walker) of Starcross. Born in Dawlish in the September Quarter of 1920. Died 2 October 1942 aged 21. 965434 Gunner Leslie Cole of 595 Battery, the Royal Artillery. Son of George and Ellen Cole (née Jarvis) of Dawlish. His brother George served and died in the 1914 - 1918 War. Born in Dawlish in the December Quarter of 1919. Died 4 April 1944 aged 25. P/JX 156747 Boy Telegraphist Maurice George Newberry Coleman of the Royal Navy, HMS Royal Oak. Parents not yet identified. Born in Dawlish in the March Quarter of 1922. Died 14 October 1939 aged 21. D/JX 347470 Able Seaman Frederick James Combstock of the Royal Navy, HMS Dasher. Son of Frederick and Beatrice Combstock (née Casley) of Dawlish. Born in Dawlish in the December Quarter of 1922. Died 27 March 1943 aged 21. 5628925 Private Jim Combstock of the 1/4th Battalion, the Essex Regiment. Son of Richard and Rosina Combstock (née Ellis) of Dawlish. Born in Dawlish in the June Quarter of 1910. Died 27 September 1944 aged 34. FX 80946 Leading Aircraftsman Dennis William Corner of Royal Navy Fleet Air Arm, 828 Squadron, HMS Victorious. Son of William and Minnie Corner (née Petheridge) of Dawlish. Born in Dawlish in the June Quarter of 1922. Died 30 July 1941 aged 19. 562001 Trooper Francis Arthur John Currey of the Royal Armoured Corps, Reconnaissance Corps attached to 2/5 Battalion, the Gloucester Regiment. Son of Arthur and Mabel Currey of Dawlish. Born in 1917.Died 24 June 1944 aged 27. 1290218 Leading Aircraftsman George Frederick Dell of the Royal Air Force Volunteer Reserve. Son of Frederick and Ethel Dell (née George); husband of Annie Irene Reeves Dell of Dawlish. Born in Wells in the June Quarter of 1908.Died 3 June 1942 aged 34. 5733855 Private Walter Philip George Drew of the Dorsetshire Regiment. Son of Walter and Eva Drew (née Jeanes) of Dawlish. Born in Wincanton in the March Quarter of 1924. Died 3 June 1942 aged 34. 108074 Pilot Officer Colin MacQueen Farquharson of the RAF Volunteer Reserve, 218 (Gold Coast) Squadron. Son of Charles and Matilda Farquharson (née Geehl) . Born in 1918. Died 29 July 1942 aged 24. D/M 7381 Chief Petty Officer Cook Archibald Harry Gibbings of the Royal Navy, HMS Courageous. Son of Henry and Mary Gibbings of Dawlish; husband of Emily Gibbings (née Eveleigh) of St. Budeaux, Plymouth. Born in Dawlish in the June Quarter of 1897. Died 17 September 1939 aged 42. D/J 107930 Telegraphist Bernard Gough of the Royal Navy, attached to the French submarine Surcouf. Son of William and Mary Gough; husband of Lilian E. P. Gough of Dawlish. Born in 1909. Died 19 February 1942 aged 33. 6026443 Lance Bombardier Charles Joseph Harlow of the 11th Medium Regiment, the Royal Artillery. Son of Joseph and Helen Harlow (née Lock); husband of Margaret Maud Harlow of Dawlish. Born in the Paddington district of London in the June Quarter of 1913. Died 18 March 1945 aged 32. 1310418 Warrant Officer Air Gunner Ernest Roy Harris of the RAF Volunteer Reserve, 521 Squadron. Son of Albert and Emma Harris; husband of Phyllis Harris of Dawllish. Born in Dawlish in the September Quarter of 1914. Died 4 October 1942 aged 28. D/K 63763 Stoker 1st Class William Henry Hollett of the Royal Navy, HMS Gloucester. Son of William and Bertha Hollett (née Wright) of Dawlish. Born in 1912. Died 22 May 1941 aged 33. Corporal John Mayo Houghton of the Hong Kong Volunteer Defence Force. Son of John Mayo and Lucy Houghton (née Trotman) of Dawlish. Born in Bristol in the March Quarter of 1906. Died 21 December 1941 aged 35. 81689 Flight Lieutenant John Osman Kellow of the RAF Volunteer Reserve. Son of John and Ethel Kellow (née Osman) of Dawlish. Born in Dawlish in the June Quarter of 1918. Died in Canada 23 June 1942 aged 24. "While in Canada recently, I visited a small cemetry in Hamilton where aircrew from RAF Mount Hope are buried. I just wanted to tell you that all the aircrew trainees are buried in individual graves. There is a remembrance ceremony each year and flowers are put on the graves by local Air Cadets." T/73438 Gunner William Luxton of 73 Battery, the Light AA Regiment, the Royal Artillery. Son of Henry and Maria Luxton; husband of Mabel Luxton (née Adams) of Dawlish. Born in 1897. Died 3 November 1940 aged 43. 1851647 Flight Sergeant Air Mechanic Frederick George Maunder of the RAF Volunteer Reserve, 514 Squadron. Son of Henry Maunder of Dartmouth. Born in 1926. Died 2 February 1945 aged 19. O/JX 243017 Ordinary Seaman Henry Malcolm McAteer ("Mac") of the Royal Navy, HMS Drake. Son of James and Kathleen McAteer (née Gibbs) of Dawlish. Born in Preston in the December Quarter of 1917. Died 21 April 1941 aged 37. Buried in the Weston Mill Cemetery, Plymouth. D/KX 86554 Stoker William Herbert Monk of the Royal Navy, HMS Fearless. Son of John and Beatrice Monk (née North); husband of Amy Monk of Filleigh. Born in Dawlish in the September Quarter of 1915. Died 23 July 1941 aged 26. D/JX 160824 Stoker Walter Joseph John Newburn of the Royal Navy, HMS Tamar. Son of Walter Newburn. Born in West Ham in the June Quarter of 1904. Died 19 December 1941 aged 37. Commandant Evelyn Aubre Nichols, civilian assistant controller of the VAD, Malta. Wife of Lieut.Col. Francis Nichols (see below); daughter of Oswald Maffett. Born in 1900. Died 12 September 1942 aged 42. Mrs Nichols was killed while serving on the British liner SS Laconia which was torpedoed by a U-Boat on 12 September 1942. She had volunteered to assist with the care of the 1500 Italian prisoners of war on board. 5123 Lieutenant Colonel Francis Peter Ross Nichols of the Royal Army Signals Corps. Son of Lieut. Col. Frederick and Florence Nichols and husband of Evelyn Nichols (née Maffett) (see above).. Born in 1893. Died 30 September 1942 aged 49. 5617558 Private Tom Payne of the 2nd Battalion, the Devonshire Regiment. Son of Thomas and Eliza Payne (née Walling); husband of Ivy May Payne of Dawlish. Born in Dawlish in the March Quarter of 1911. Died 3 April 1942 aged 30. Lieutenant Geoffrey Annandale Ramsay of the 5th Battalion, the Royal Tank Regiment. Son of George and Jane Ramsay. Born in Warwickshire in the June Quarter of 1916. Died 2 April 1941 aged 24. D/JX 249360 Able Seaman Leslie Rendle of the Royal Navy, HMS President III. Son of Sidney and Ellen Rendle. Born in Bideford in the June Quarter of 1914. Died 18 December 1941 aged 27. Buried in Belfast City Cemetery. Captain Alan Francis Salt of the 1st Regiment, the Royal Horse Artillery. Son of Henry and Philippa Salt of Teignmouth. Born in 1916. Died 29 November 1941 aged 25. 2663599 Guardsman Arthur Henry Salter of the 3rd Battalion, the Coldstream Guards. Son of William and Emily Salter (née Hexter) of Dawlish; husband of Florence Annie Salter of Dawlish. Born in Dawlish in the September Quarter of 1909. Died 9 September 1943 aged 34. 1200961 Leading Aircraftsman George Richard Sampson of the RAF Volunteer Reserve. Son of Richard and Octavia Sampson of Ilfracombe; husband of Beryl K. Sampson. Born in Barnstaple in the March Quarter of 1911. Died 28 April 1944 aged 33. Buried in the Marlborough Cemetery, Ilfracombe. D/SSX 30842 Boy 1st Class Wilfred John Saunders of the Royal Navy, HMS Glorious. Parents and date of birth not yet known. Died 8 June 1940, age not known. D/JX Ordinary Seaman William Walter Joseph Sellick of the Royal Navy, HMS Raleigh. Son of William and Annie Sellick; husband of Annie Sellick of Dawlish. Born in 1913. Died 28 April 1941 aged 28. D/K 57937 Petty Officer William John Sharland of the Royal Navy, HMS Repulse. Son of George and Emelia Sharland (née Smedon); husband of Elsie Sharland of Dawlish. Born in 1896. Died 10 December 1941 aged 45. 521127 Warrant Officer Pilot Kenneth Robert Whitehall of the RAF. Son of Ralph and Mabel Whitehall of Dawlish. Born in 1914. Died 6 July 1942 aged 28. 174918 Pilot Officer Air Gunner George Bernard Stone of the RAF. Son of Francis and Emma Stone (née Dawe); husband of Ivy May Stone of Dawlish. Born in Holsworthy in the June Quarter of 1911. Died 13 August 1944 aged 33. 2658730 Lance Sergeant George Henry Stoneman of the 3rd Battalion, the Coldstream Guards. Son of Fred and Nellie Stoneman; husband of Yvonne Stoneman of Dawlish. Born in 1921. Died 23 June 1944 aged 23. Awarded the Military Medal. The award was gazetted 27 January 1944. 5620702 Sergeant Eric Goven Tapper of the Royal Artillery 86 Anti-tank Corps (5th Battalion, the Devonshire Regiment). Son of Lionel and Clara Tapper (née Forster) of Dawlish. Born in Dawlish in the June Quarter of 1921. Died 11 July 1944 aged 22. 5953902 Corporal Archibald Train, of the 7th Battalion, the Hampshire Regiment. Son of Alfred and Emily Train. Born in Birmingham in the June Quarter of 1918. Died 2 October 1944 aged 29. D/JX 159152 Leading Telegraphist Owen Mountford Tucker of the Royal Navy, HM Submarine HMS Tigris. Son of William and Lillian Tucker (née Smith of Dawlish. Born in Dawlish in the December Quarter of 1922. Died 10 March 1943 aged 20. PLY/21538 Private Sidney Alfred Vosper of the Royal Marines, HMS Neptune. Son of George Vosper of Dawlish. Born in Dawlish in the December Quarter of 1922. Died 9 December 1941 aged 36. Lieutenant Charles Henry Ware of the Royal Armoured Corps, the Royal Tank Regiment. Parents not yet known. Born in Dawlish in the September Quarter of 1909.Died 24 April 1942 aged 33. 741598 Sergeant Pilot John Victor Wadham of the RAF Volunteer Reserve, 145 Squadron. Son of Victor and Lilian Wadham (née White). Born in the Isle of White in the June Quarter of 1919. Died 12 October 1940 aged 21.